How are you going to reach new players in new regions with your current team and budget? It’s no easy feat, and can be an expensive risk for a new game. You’re stuck between the costs and workload of meeting the needs of new players, and the risks of taking on more infrastructure than your game can support. You might think the promise of the cloud will save the day, but moving from a centralized infrastructure to the cloud can be a massive undertaking, with lots of pitfalls and hidden costs. 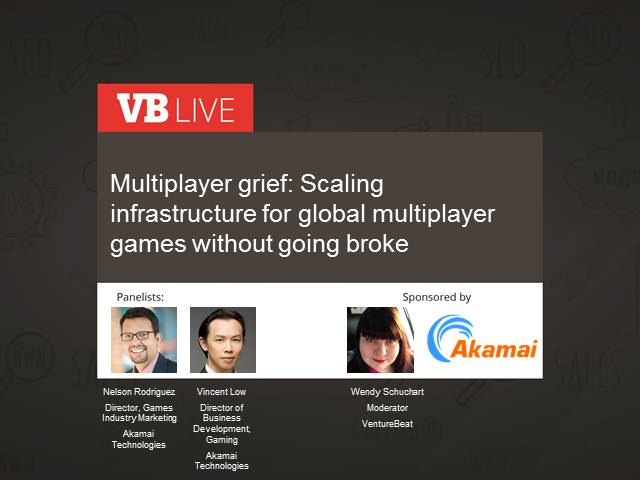 Join us for a deep dive into how some publishers are pushing the limits of technology to deliver great multiplayer experiences globally, without having to scale up their server footprint, or launch a painful, time consuming migration to a cloud infrastructure. Register today for this free VB Live event with interactive Q&A session! Sales leaders are continually on the hook to make the current quarter outperform the last, and now AI and machine learning offers brand new ways to improve workflows and conversion rates. Artificial intelligence can increase your lead and appointments by fifty percent, reduce new rep ramp time by 30 to 60 percent, and increase win rates by 10 percentage points. It can ensure a rep’s time is all impact, all the time, by automating tasks, highlighting conversation best practices, and slashing whats essentially downtime by 40 percent — and even initiate contact with leads, qualify them, follow up, and sustain them. Leaving sales reps the time and the primed field to close the deal. AI and machine learning technologies just keep maturing, making it easier — and smarter than ever — to plug in to a new way of doing business. To learn more about how early adopters have transformed their sales processes and enjoyed enormous gains in return, don’t miss this VB Live event! Enterprise analytics will trend toward a $70 billion market in 2019, now that business users everywhere are demanding immediate, universal access to data and reporting. With the advent of AI, data access and accuracy are being improved even more. But AI also brings with it responsibilities around governance, privacy and protocol. So on one hand, AI is helping prepping clean, rich data -- for example auto-completing or correcting data where it does not exist or is wrong, or even auto-suggesting reporting dashboards, equipping decision-makers to understand what reports to follow and what the data is telling them. On the other hand, this speed and cornucopia that AI provides brings with it a new urgency to make sure that data is all safe, especially given heightened attention across industries to concerns around privacy, bias, and fairness. To learn more about how Ai is transforming enterprise analytics, don’t miss this VB Live event! It’s do or die time: According to Gartner, the global business value from AI leapt by 70 percent last year, to $1.2 trillion, and it will triple to $3.9 trillion in 2022. So enterprises interested in getting on the AI train should jump now -- before you lose some major competitive advantages. Of course, the biggest challenge for enterprise companies is figuring out the build versus buy question. There’s the build-in-house model of AI implementation, with open-source toolkits and expensive, but essential new hires. The number of startups offering full-service consultation, with set-up and service is proliferating, but who do you choose, and what do you pay for? And somewhere in between those options there’s the artificial intelligence as a service (AIaaS) approach — and again, the field of vendors is crowded with options. There’s no easy, one-size-fits-all answer — but there are experts with real insight into how to identify your business needs, and where to get started implementing AI in the most cost-effective, profitable way possible for your enterprise. To get up front and personal with pros in the trenches now, register now for this VB Live event! Social networks today are undergoing a massive paradigm shift when it comes to content moderation. From tragic shootings broadcast live on Facebook, to YouTube removing comments on children's videos due to child predator concerns, social platforms are under fire from users, governments, and law enforcement to adopt better technology and strengthen their content moderation practices. It’s not all bad news. Business leaders have also realized that accurate, efficient moderation, coupled with positive reinforcement, can increase user retention and encourage growth. But who is responsible for enforcing these policies and practices? How did hate speech, abuse, and extremism become the "cost of being online"? And how can like-minded businesses band together to raise the bar and make their social platforms engaging, safe for all users, and ultimately, more profitable? Join Two Hat CEO and founder Chris Priebe and veteran analyst and market influencer Brian Solis for an insightful talk about the changing landscape of online conversations and the role of content moderation. Social abuse and objectionable materials need no longer be the price of admission. Register today for this free event! * The business benefits of joining the growing movement to "raise the bar"
* Brian Solis, Principal Digital Analyst at Altimeter, author of "Lifescale"
Every founder starts with a big idea, but only 1 out of 10 see their idea succeed. So what’s the difference between the fintech startups that get off the ground and those that don’t make it out of the gate? What are the secrets of the startups that disrupt entire industries? This is your chance to find out how founders and VCs look at creating successful startups first-hand. Our panel of industry experts will cover a range of topics, from getting started building your team, to the importance of finding an impactful mentor, and more. They’ll also answer questions from future startup founders in a Q&A. It’s everything you need to travel the path from big idea to successful startup. AI is moving beyond just the cloud. With powerful AI algorithms enabled on devices from smartphones to consumer machines, automobiles, robots, and more, we're unlocking a world of intelligent, connected devices that can perceive, reason, and take intuitive actions based on awareness of the situation. On-device AI offers immediate response, enhanced reliability, increased privacy, and efficient use of network bandwidth, and supports everything from superhuman computer vision and natural language processing, to wireless connectivity, power management, photography, and more. The applications that on-device AI is enabling are capturing consumer attention. And it's igniting real demand for better voice assistants, more powerful camera features, smarter cars, and more. The opportunities for always-on, intelligent devices that do all or most of their thinking on the device are enormous. To learn more about this innovative emerging technology that's already at the fingertips of developers, OEMs, and ISVs, don't miss this VB Live event. Customers choose to work with you not just based on what you deliver, but how you deliver it. Traditionally the big guys have had the advantage in resources and personnel. But with the digitization of customer communications, sales processes, and customer service, small and medium-size companies can now do more than catch up -- they can compete. Affordable, accessible business technology is at your fingertips, and it can help you manage prospect and customer relationships in a way that feels personalized, accelerate business workflows and processes, and not just meet but exceed customer expectations while you boost your sales growth. To learn more about how technology is transforming the way SMBs do business, and how to launch the strategy that ensures your company maintains competitive advantage, don’t miss this VB Live event! The competition is coming. By 2020, eighty percent of SaaS players will move to a subscription-based model, which means your success strategies have to evolve — and that includes the all-important fundamental: how your subscriptions are structured. Your subscription pricing and plan structure have a profound impact on subscriber acquisition and retention, and once you nail the formula, you'll see revenue increase. Do you choose an annual or monthly plan? Offer a trial or discounts? This is where a test plan is critical. Combined with benchmark data, you can test and iterate your way to the right pricing and plan structure. And when important decisions are backed by comprehensive benchmark data, you’re far more likely to see an increase in adoption and revenue. Join this VB Live event to discover essential SaaS benchmarks and best practices to maximize revenue, improve acquisition, and spur adoption. Cyber threats continually evolve, growing more sophisticated and aggressive, regularly overwhelming and bypassing traditional security solutions. With AI-powered software trained on large datasets of cybersecurity, network, and even physical information, cybersecurity solutions are increasingly able to detect and block abnormal behavior, even without a known signature or pattern. Adding AI into the mix is a major turning point for cybersecurity. It’s growing clear that artificial intelligence and machine learning is the safest, and perhaps the only, path for cybersecurity professionals to really lock down their data and protect the enterprise. These systems offer the fastest, smartest ways to identify and analyze threats in real time -- and find the quickest way to taking them down. To learn more about how to improve privacy and security, and how new AI-powered security can protect companies and their customers better, don’t miss this VB Live event! * Jim Ducharme, VP, Identity Products, RSA. User experience is swiftly overtaking price as the most important competitive differentiator. That means wowing your customers at every point of interaction and engagement. And lately, new approaches fueled by AI and significant data produced by cross-platform experiences are putting UX under a new kind of microscope and helping to drive positive results. When harnessed correctly, AI really just means ultimate personalization. And this can reward you with loyalty, affinity, and word of mouth. User experience design (UX) isn’t a guessing game anymore. Artificial intelligence is your superpower, and machine learning your secret weapon. AI helps you personalize the customer journey at every step dynamically, crafting unique, individual experiences that learn along the way, making them more relevant, more engaging, and more delightful. To learn more about why AI should be the foundation of all your user experience design, and where to start, don’t miss this VB Live event! * How AI supercharges the relevancy, elegance, and engagement of modern design. By 2020, 90 percent of businesses will have moved to a hybrid cloud infrastructure, seizing both the competitive advantages of digital evolution -- and the economic and strategic benefits of maintaining legacy applications on premises. But once your data moves outside your private architecture, you're facing a new world of potential attacks and security breaches that your current security practices just can't match. Just for starters, not only will you need to implement effective RBAC to lower risk of unauthorized access and enforce mandatory multi-factor authentication, you'll also have to tap into the power of automation to validate security compliance baselines, detect unauthorized cloud config changes, and power self-healing infrastructure. Additionally, application-centric security is a must, with real-time visibility into application dependencies and performance metrics, plus an automatic micro-segmented security policy enforcement, and more. To learn more about the advantages of hybrid cloud architectures, where your security needs shoring up, and how to best protect your enterprise and data with automated and application-centric security practices, don't miss this VB Live event! IT leaders look to technology as a business differentiator and rely on it to foster innovation. Enterprises have discovered that hyper-converged infrastructure (HCI) can be the foundation of a modern, cloud-like datacenter. But don’t stop there — going beyond HCI delivers more savings, increases IT agility, and supports multi-cloud goals when you add virtualization as an integral part of your stack. How do you harness the power of HCI and virtualization? Sure, there are a wide variety of tools on the market, but choosing the wrong HCI platform could limit your options in how you operate your datacenter or could impede cloud goals — including those associated with virtualization. To learn more about the power of HCI and virtualization, how virtualization can remove complexity and increase efficiency, and how to choose the right HCI tool, don’t miss this VB live event! Bots, artificial intelligence, and messaging — cost-effective, easy-to-implement automation technology —- is gaining a major foothold in customer service organizations, and the impact is palpable. Contact centers are on track to shrink by 50 percent in the next three years as routine tasks are taken over by faster, efficiency-saving bots that can triage requests, boost customer satisfaction, and offer an 8.6 percent increase in profit margin per customer. These technologies are also making it easy to tap into the gig economy, which is producing a growing supply of tech-savvy labor for companies that also saves costs. For workers, it means flexible arrangements with low barriers to entry, plus more satisfying employment, now that the grunt work has been eliminated by automation. AI and automation is set to level up the workforce, the economy, and your bottom line. For a closer look at the long-term implications of automation, how to invest in the brave new world of work, and more, don’t miss this VB Live event! * Future of work - what does it look like? While companies have been ditching traditional marketing methods in their race to capture the online-savvy millennials, no one is on their phone 24/7, and delivering brand messages out in the world is still vital to capturing mindshare. Those first-gen marketing methods, including outdoor, tv, direct mail, and more, are still valuable and essential to building a stronger bottom line, especially when integrated as a vital part of an overarching marketing campaign, firing on all cylinders. That’s easier than ever, because traditional doesn’t mean old-school and analog anymore, and innovations in marketing technology don’t only apply to your online channels. You can apply your martech capabilities not just for tracking, measurement, and attribution, but to keep tabs on omnichannel competitor strategies, design the most effective campaign copy in every arena, create the most impactful rollouts between all your channels and more. To find out how to integrate offline marketing channels with your online efforts, how marketing technology can bring those traditional methods into the twenty-first century, and more, don’t miss this VB Live event! The landscape of voice and chatbot-to-customer interactions is blowing up. Whether it’s a trusted AI assistant like Alexa or Google Home, or an integrated voice or chatbot tool within a brand interface like Kayak’s customer service experience, customers are increasingly willing to engage with brands via voice chat. AI assistants are getting smarter, and becoming capable of helping consumers sort through the avalanche of choices available in every decision, from buying phone plans to toothbrushes. And your marketing efforts will have to shift priorities in a major way to capture the attention of these newly connected customers as assistants get smarter and customers learn they can rely on their results. To hear about actual voice chat use cases, the differences between integrated bots and AI assistants, and how to leverage voice and bots for amaze-and-delight experiences right now, don’t miss this VB Live event! They’re savvy, those consumers – they can smell “targeted advertising” from a mile away, and they’re really not interested in it. But they’ll listen to recommendations from their peers, and they trust the integrity of the influencers they follow to never steer them wrong when it comes to brand buy-in. In a world where consumers are smarter, live streaming makes TV ads irrelevant, and ad blockers are de rigueur, influencer marketing – when you do it right – means making meaningful connections, building trust, and securing loyalty. What does “right” mean? Don’t miss this VB Live event where you’ll learn how influencers can improve your brand reputation, how to build authentic relationships with the right influencer for your brand, and the mistakes to avoid at all costs. * How influencers and customers drive brand reputation and how they differ. Money is pouring into esports. There are more players, more games, more viewers, and bigger prize pools — and companies are taking note. Investment is coming from all angles, and everyone is looking for a piece of the pie. But many of the existing monetization models of esports only seek to follow the tried and true formats from traditional sports. There is a lot for the video game industry to learn from the legacy sports broadcast model; but there’s a catch: The video games industry uses some of the world’s most advanced interactive technology to create some of the world’s most compelling entertainment experiences. So why would we just do it the same way as before? The answer? We probably won’t. Not for long at least. In this special session, our panel of experts will unpack the old and the new of esports, and explore where genuine innovation may come from in the future. We’ll discuss how to get the most out of traditional methods, and how some companies are experimenting with new approaches to engaging with audiences and driving revenue. Register now to join us for free. Forrester found that only 11 percent of companies are able to deliver a customer experience (CX) that sets them apart from their competition. Without a CX that elevates the brand, companies are at risk of being left behind while customers choose to spend their purchase dollars or business investments elsewhere. There are four key ways to ensure that your CX is flawless and your market share keeps growing. It starts from the inside out, with a unified vision of CX; a strategy to solve problems fast while offering self-help; continuous, ongoing iteration and improvement of best practices, and a consistent, personalized experience in every way. To learn more about why CX has to be the core of your company and how to launch the strategy that ensures your company maintains competitive advantage, don’t miss this VB Live event! More and more, savvy customers are willing to share info about themselves and their browsing behavior — but in return, you have to use those powers for good. Or in other words, start serving them up completely personalized web and mobile ads that reflects their tastes, values, and preferences in every (not-creepy) way. It’s the key to delivering the kind of goods and services that keep your customers clicking — and more than happy to keep handing over their personal information. It’s also hard to pull off. To learn how companies like Pandora flawlessly serve up the customized advertising that clicks, don’t miss this VB Live event! * Best practices companies like Pandora and Trulia use to create authenticity and bring in more revenue. Your instincts are good — but AI can make them flawless. With AI, every time a customer engages with your brand, you’re making that moment really count. Add AI powered predictive analytics to ensure the right message at the right time, targeting is accurate and high-value, and customer support is proactive. Automate chat-based customer service, and give your agents more info off the top. Level up the shopping experience by offering the right products at the right time — and add contextual conversation to narrow their choices down. Customers want this kind of service and attention. And if you can’t deliver, they’re going to find the company that can. So don’t miss this VB Live event, where you’ll learn more about being relevant to your customers, making their engagement meaningful, and more! * How to use AI-fueled data analytics to create tactical marketing plans. Founded in 2006, VentureBeat is the leading source for news and perspective on technology innovation. Our news, analysis, and events provide deep context to help executives, entrepreneurs, and tech enthusiasts make smart decisions. We aim to inform and inspire. Led by founder and CEO Matt Marshall and a team of experienced journalists, VentureBeat covers a range of technology trends — from artificial intelligence to virtual reality, small business to enterprise, health tech, cloud, games, and more.